Your guitar is buzzing when you play fretted notes, the action is way too high, tasty licks up on the 12th fret keep choking out and ruining your solo. If you’ve ever felt this way about your guitar then chances are you’ll need a level and recrown. By “sighting” down the neck i.e. getting your eye as close to the bridge as possible, you see where about the neck is warping. The neck warps in two ways. The truss rod is there as a tool to counteract the necks’ natural tendency to be pulled and twisted under the tension of the strings. Tightening the truss rod will create “Backbow” in the neck while loosening it will cause “Upbow”. Bear in mind that the truss rod only has control over the first 7 frets or so. So keep that in mind when you’re looking for something called a rise-in-tongue. And what is the tongue? 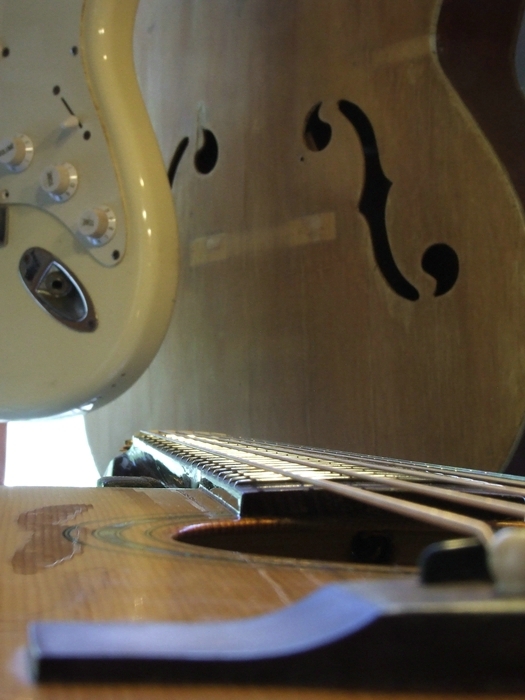 The tongue is the area of the guitar where the neck meets the body. 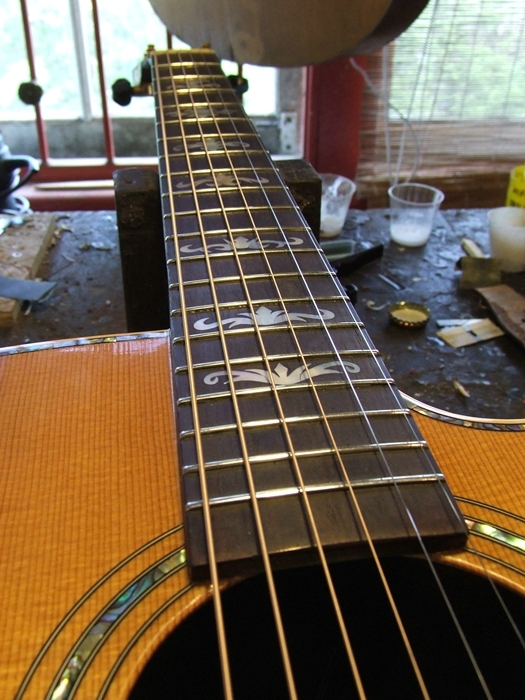 This picture shows an exaggerated example of what the neck does under string tension. The first half of the neck “pulls up” creating a sag around the 7th fret area. Now this increase in tension travels along the neck and compresses at the point in which the neck meets the body. This compression causes a slight hump on the end of the fretboard, this is known as rise-in-tongue. This is the reason why simply tightening the truss rod to create back bow and lower the action doesn’t always work. If your neck has a rise in tongue then your fretted notes from the 12th fret and back will be hitting those slightly higher frets from the 12th fret forward. This is where “the level” comes in. Leveling is a technique that ensures each fret is sitting at the same height as the one next to it, all the way up the neck. We put the neck under a slight back-bow to compensate for the up-bow that is produced when the neck is restrung and under tension. 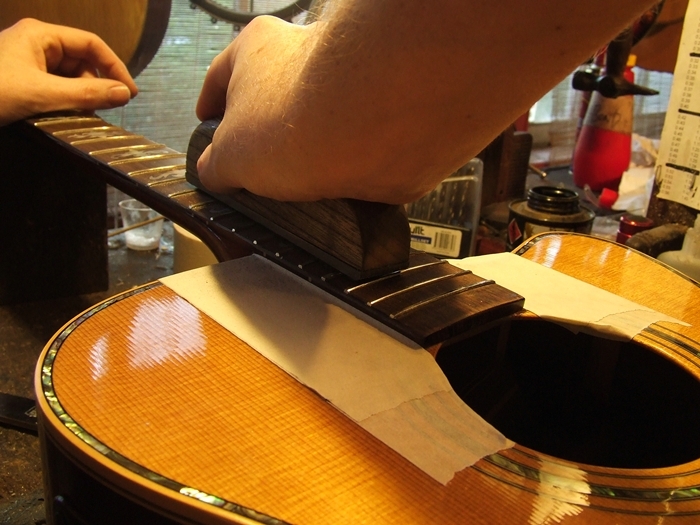 We then run a leveling file over all of the frets until they have all received even contact. Seeing as this technique deals within the 10ths of a millimeter, frequent checks using a variety of techniques are needed to unsure that you’ve leveled enough, but not too much. Fret rocker. This will tell you if each fret is level to the one next to it or not. The long straight edge gives you an idea of what sort of action you’ll be able to play when the job is done. Last but definitely not least is sighting the neck. Never think that the eyes and hands are inferior measuring tools, you’ll be able to glean a lot of information just by getting your eye as close to the saddle as possible and looking down toward the nut. You’ll be able to see pretty quickly if your neck has too much upbow or if there is a significant rise in tongue. As you can see here the neck itself has a very slight rise in tongue , with a slight upbow down near the nut. BUT, the FRETS are level. Removing that rise in tongue completely can mean a full refret and either sanding or planing the fretboard to get it level. This unnecessarily removes timber from the neck and is a problem that could have been solved simply by removing the undulations from the frets instead. Once all of your frets are level, it’s time for the recrown. 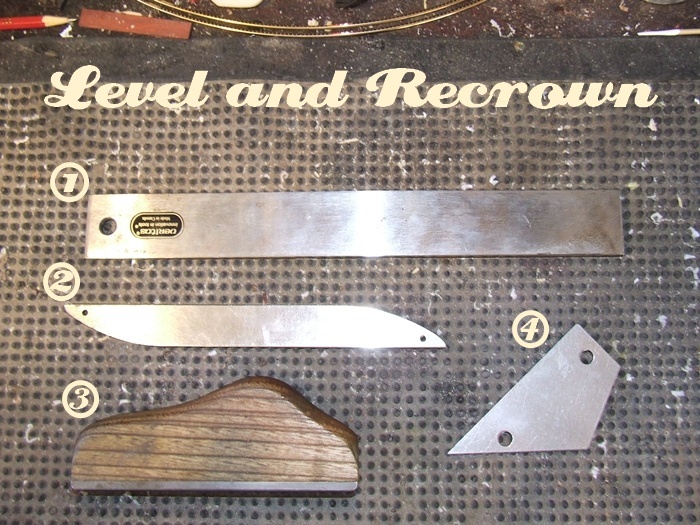 The recrown is the process of refiling a profile back into the frets. This is done firstly with a crowning file and then graduated grits of sandpaper. 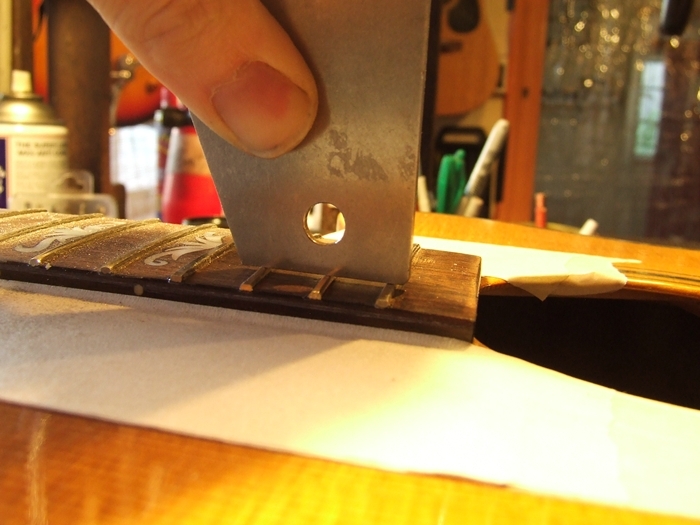 The filing and sanding is done until the frets are restored to an as new shine. A level and recrown will sort out minor issues in neck warpage. Especially warping that results in a rise in tongue, or too much up-bow. 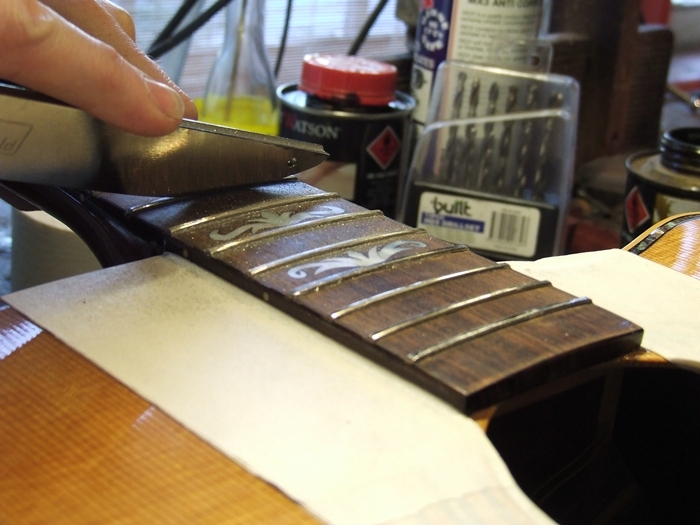 It is the process of filing all frets to the same height reprofiling and sanding them back to a beautiful shine. If the warpage is more severe, or the frets have been worn down by years of playing, a partial or full refret, or even a neck reset might be needed. 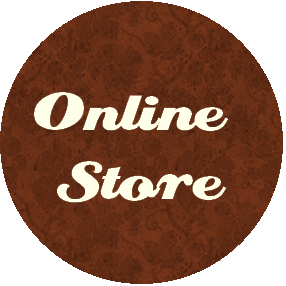 Get in touch now for a Guitar Fret level and Crown – you will feel the difference immediately.